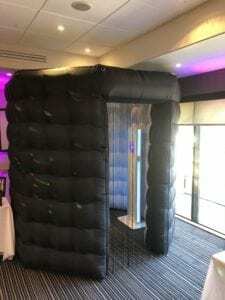 A few weeks ago I took my inflatable photo booth to The Loch Ness Country House Hotel near Inverness along with my mobile disco for Lisa and David’s wedding reception. I decided to man the photo booth myself and got a local Dj Simon to be the Dj for the wedding. 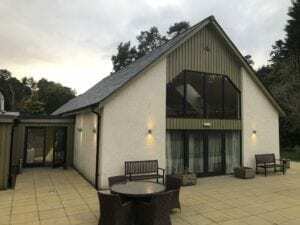 Loch Ness Country House is a lovely venue with easy ground floor access to the function room and also to the room where I set up the photo booth. Loch Ness Country House Hotel function room. Loch Ness Country House Hotel is one of my favourite venues near Inverness. 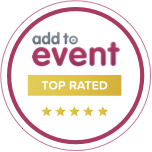 This area is very well served by several exceptional wedding venues including Achnagairn House, The New Drummossie Hotel, Bunchrew House Hotel and Loch Ness Country House Hotel. Getting back to my topic of photo booths I wanted to offer something exceptional and different to everybody else that was in the photo booth industry. My first purchase was my black octagonal inflatable photo booth. I chose this booth booth as it looked really classy and I loved it from the moment I saw it. 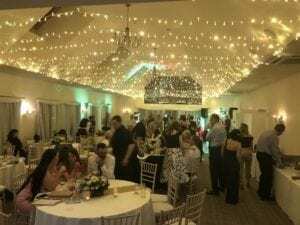 It’s extremely easy to set up and this is always a great advantage at weddings where sometimes you have room turnarounds which give you very little time to set up. 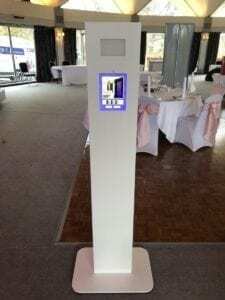 The photo booth also has lights in the base to add a bit of colour and class. The clever part of the photo booth is the photo pod that sits inside it. It contains a steel case with an iPad and a light to illuminate you which can be dimmed and varied between a white light or a warm yellow light. As anyone who owns an iPhone or IPad will tell you the quality of photos it takes are incredibly good and I would say as good as most DSLR cameras. The photos are amazing and I can add the names of the bridal couple and the date of the wedding at the bottom of each photo. Here’s an example from Lisa and David’s wedding. The Photo pod can also send pictures to social media like Facebook, Twitter or Instagram as well as email and printing them. The photo below of my photo pod was taken at The Atholl Palace Hotel wedding fayre in Pitlochry. I wanted to show you what it looks like outside the inflatable booth. If you’ve booked my mobile disco you can add this as an extra without printer for just £99. The one thing my photo booth does that really makes such a huge difference is the size of prints I give you! I believe I’m the only photo booth hirer that gives you huge 6×9 prints instead of the usual 6×4 prints which are two and a half times smaller. 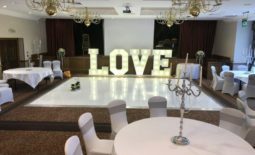 When I was doing weddings previously and other photo booth companies were providing the photo booths I noticed so many prints just lying about on tables and on the floor or in the bin at the end of the night. I picked up the photos and had a look at them and they were so small and had more advertising on them than the photo itself. I decided I would offer something much better that I’d want to take home. 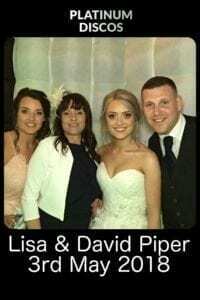 I was delighted that when I walked round out at the end of the night that not one photo had been left and that Lisa the bride was sat comfortably on a chair in the lounge looking through all the duplicate photos that we put in her photo album. That night I almost filled the photo album which takes 100 six by nine photos and allows your guests to write next to the photo they took. I knew then that my choice to print big prints and to buy that style of booth had been the right decision. The other thing that convinced me was that almost everybody commented on how impressive the photos were in not just size but quality too! Every girl at Lisa’s wedding who was getting married in the future asked for a business card and said they would book me. My photo booth is always supervised to assist you and to show you the features as it does so much. I also provide two prop boxes which have lots of different props and you can ask for a particular theme too! I have a Harry Potter party theme coming up soon so I bought loads of Harry Potter theme props! I want you to experience the very best photo booth possible and my one is exactly that. Huge prints, great quality photos and friendly reliable staff. Thanks for reading and I hope you’re sold, I was. My mobile disco gigs in Dumfries, Carluke and Monifieth	Giant letters for weddings and parties.